Knitting Traditions Spring 2013 brings 25 historical knitting patterns with inspiring and informative companion stories. Patterns include knitted sweaters, Orenburg lace, knitting for babies, accessories, and more. Knitting Traditions Spring 2013 brings together knitting traditions from around the world and across time. This issue features 25 knitting patterns with inspiring and informative companion stories that frame the projects in cultural and historical context. Patterns include a vintage pucker-stitch knitted sweater, Orenburg lace scarves, gorgeous gloves and mittens, a miniature silk bag based on one from the 14th century, a sweet sweater and mitts for baby, and more! Plus, you'll find poignant stories about special knitters and a look at knitting schools in Elizabethan England. This vintage knitted sweater pattern, called "Jumper with 'pucker stitch' pattern" in its original publication, has been updated by Debbie O'Neill to include an added schematic and gauge information, making it accessible to modern knitters. A Vintage Knitted Tie, Jack Frost Baby Cardigan, Groenlo Mittens, An Anna Marie Jensen Doily, Elizabeth Jackson's "A Stocking"
Learn about the history of the Jack Frost Yarn Company and its popular, now-vintage knitted pattern books, as written by Heather A. Vaughan. Enjoy photographs of early Jack Frost pattern booklets and create your own vintage baby cardigan with the Jack Frost Baby Cardigan knitting pattern. Join Galina Khmeleva in an exploration of different types of Russian knitting needles and create your own set with instructions for personalized knitting needles. Try your hand at the challenging Honeycomb lace motif with Galina's knitted scarf pattern. Learn about the history of Waldorf schools and their practice of teaching children to knit in the first grade to improve hand-eye coordination, concentration, and creativity in students. Create your own Waldorf-inspired knitted horse toys to foster creative and imaginative play for a child in your life. Enjoy all these projects and stories first-hand. 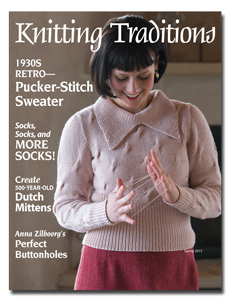 Get your copy of Knitting Traditions Spring 2013 today!